Unfortunately, the dress you are looking for (Style: DMO-J315136, Name: DMO-J315136) is no longer available. Here's a long black prom dress that is anything but ordinary. Fun ruffled cold-shoulder sleeves grace the fitted bodice of this stylish black formal dress. Thin shoulder straps connect the front keyhole bodice to the deep v-back feature on this junior-size prom dress. Under $100, this affordable long black dress has sheer-illusion lace that reveals a glimpse of midriff for a flirty look. The long jersey skirt fits comfortably over your curves before flowing to the floor. 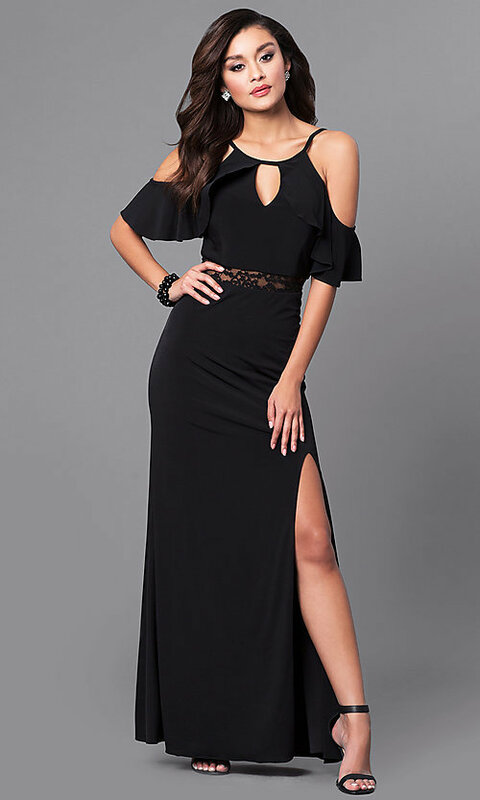 An alluring side slit completes the look for wedding receptions or prom on this trendy long black prom dress that is reasonably priced and stylish.